Spots on peony leaves or mold on the plants is usually caused by one of two peony fungal diseases, botrytis blight (gray mold) or leaf blotch. These diseases tend to flare up in wet weather and plants that are infected early in the season may have severe leaf damage by late summer. This peony fungal disease is especially common during a wet spring, and can flare up in cool rainy weather in summer too. It is especially common when drizzle or rain continues for several days in a row. This disease appears as a thick velvety gray mold on the plant stems and leaves. Sometimes you’ll see spots on young leaves and stems before they turn black. Flowers can fail to open, or turn brown, and spread the infection down the stem. 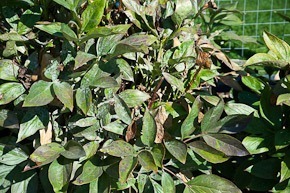 In severe cases, the fungus can cause a significant number of stems and leaves to turn brown and begin to die back in mid-season. What to do: Remove infected plant parts (blighted buds, flowers, leaves and stems) when you notice damage. Wait until conditions are dry; cutting the plants back when they are wet with dew or rain can cause fungal spores to spread. Prevention: If you have spots on peony leaves, cut stems at ground level in the fall, and thoroughly clean up all peony remains, and discard in the garbage (not in your compost pile), or burn or bury in the ground away from your peonies. If your peonies look like they have burn spots on them, the problem is most likely leaf blotch, which is common in warm, wet weather. It is caused by a fungus called Cladosporium paeoniae, which appears as dark reddish purple blotches or spots on peony leaves in mid- to late summer. Peony leaf spot disease infections are encouraged by spent petals clinging to damp foliage. Prolonged humid conditions at the petal-leaf interface allows fungi to become established. Rainy, cool weather will cause the diseases to spread among the leaves. None of the leaf-spotting diseases adversely affect the vigor of the plant, but the spots are not pleasant to look at. It is always a good policy to remove peony flowers from the plants before they shatter. Prevention: Your best defense is to thoroughly deadhead all flower stems and to clean off an old petals on your plants. What to do if you notice diseased leaves: If you already have leaf blotch, remove all infected plant parts, and, as with botrytis, do a careful clean-up of stems and leaves in the fall. Fungicides can help prevent peony foliar diseases. Remember that while fungicide sprays can help nip fungal diseases in the bud, they will not cure the problem once it has taken hold. When you see signs of fungal disease, remove affected plant parts, as described above. Start fungicide applications early in the season when new peony growth is two to four inches tall. Be sure to follow product recommendations, and spray so that tops and undersides of leaves and stems are covered. If you live in Ontario, you won’t be able to buy commercial fungicides, as they are banned under the pesticide law that came into effect in spring 2009. You can make your own mixture by dissolving two tablespoons of baking soda with a few drops of dish soap (to help the baking soda solution adhere to the plants) in a gallon of water and apply the mixture with a hand sprayer.